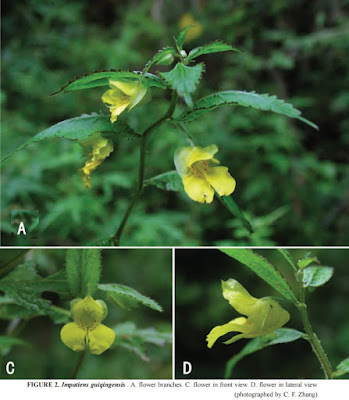 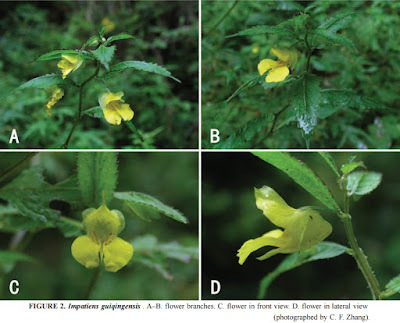 Impatiens guiqingensis S. X. Yu (Balsaminaceae), a new species from Gansu Province, China, is described and illustrated. The new species is superficially similar to I. dicentra in having 1–2 flowered racemose inflorescences, lateral sepals with dentate margin, top of lower and upper petals of lateral united petals with bristle appendages, but differs from the latter by yellow flower, lower sepal without spur and dorsal petal with unapparent crest. Moreover, the occurrence of the new species is also different from the related one.